600 pound tilting optical rotary table 16" precision with illuminated reticule eyepiece. By Optical Measuring Tools LTD OMT of Maidenhead Berks England. 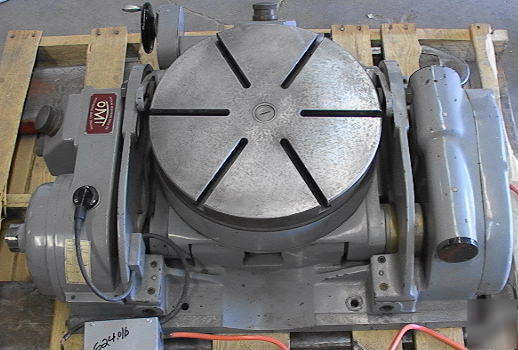 Cranks up to about 90 degrees of tilt-shown above only partly tilted. By Optical Measuring Tools LTD OMT of Maidenhead Berks England. We don't know what the dimensions table above means as it does not appear to relate to what we see. The eye-piece shown above is normally covered by a cup. We don't have a bright enough bulb to properly illuminate the retical. Overall width is a bit more than 3 feet and depth is about 2 feet. Might be just what you need for your really husky precision rotary adjustment and tilt application. Condition looks good vintage used. Seems complete except for the handle for cranking the angle and needs a proper bulb for the illuminator so we don't really know if the optical path is working.